I hope you had a great holiday season and you enjoyed the 19.1 release. We were delighted to read your reactions and go through your feedback. We had a smooth release and 19.1 got a great reception. The fact that it was ready just before Christmas made it feel really special. Although we needed a break after the stable release, we were able to interact with BETA testers and fix a significant amount of bugs thanks to their reports. I’d like to apologize for posting this late and send my thanks to all the people who helped us test and identify bugs during the BETA phase. We release Cinnamon an entire month before Linux Mint, and we see it happen every single time, when we hit the Mint BETA, we get a huge amount of bug reports and the quality of the product increases significantly. Of course, we get early feedback from rolling distributions and we’re grateful for that too, but there’s nothing more important, in terms of testing, than our BETA release. This January, our first priority is to port all our new packages towards LMDE 3. This is happening right now, and it will be followed by a review of all the pull requests which didn’t make it in time for the 19.1 release. After that we’ll open up the next development cycle and we’ll start working on the new features which will land in Linux Mint 19.2. As usual, we’ve got many ideas but very little time, we’ll do our best to make as many of them happen as possible and we’ll post previews as we implement them. Many thanks to all of you for your support, for your help and for your donations. This is an amazing project to work on, with a fantastic community, and a fantastic team. Here’s to 2019, I hope we’ll have a great year 2019 together. $300 (3rd donation), Mikhail C.
$163 (5th donation), Jan S.
$109 (15th donation), Hendrik S.
$100 (4th donation), Sheila S.
$100 (4th donation), Mirza B. $100 (3rd donation), Jerry S.
$71 (3rd donation), Jacques P.
$65 (2nd donation), Miguel V.
$54 (3rd donation), Soeren S.
$54 (2nd donation), Campbell W.
$50 (5th donation), Paul C.
$50 (4th donation), Wallace P. M. J. $50 (3rd donation), Garry R.
$50 (3rd donation), Thomas H.
$50 (3rd donation), Brian S.
$50 (2nd donation), Bruce K.
$50 (2nd donation), Matthew H.
$50 (2nd donation), Craig B. $50 (2nd donation), Juan E.
$50 (2nd donation), Paulo S.
$50 (2nd donation), Gary B. $38 (4th donation), Ian W.
$36.15 (3rd donation), Jon G.
$33 (105th donation), Olli K.
$33 (5th donation), John H.
$33 (3rd donation), Stephen M.
$33 (3rd donation), Benjamin E.
$33 (2nd donation), Carl A. $30 (10th donation), Roger B. $30 (5th donation), Anthony L.
$30 (2nd donation), Daniel K.
$27 (4th donation), Marc S.
$27 (3rd donation), Michael W.
$27 (2nd donation), Bernd J. $27 (2nd donation), Richard L. F.
$26 (3rd donation), Ricky G.
$25 (88th donation), Ronald W.
$25 (25th donation), Larry J. $25 (7th donation), Murray C.
$25 (5th donation), Arthur K.
$25 (5th donation), Oswaldo H.
$25 (4th donation), Donna B. $25 (3rd donation), Chungkuan T.
$25 (3rd donation), Scott O. $25 (3rd donation), Chris B. $25 (2nd donation), Fahri T. C.
$25 (2nd donation), William B. $25 (2nd donation), E. S. .
$22 (21st donation), Derek R.
$22 (10th donation), Anthony M.
$22 (7th donation), David M.
$22 (5th donation), Thorsten H.
$22 (4th donation), Z. K. .
$22 (2nd donation), Johannes T.
$22 (2nd donation), Stefan B. $22 (2nd donation), Goran L.
$22 (2nd donation), Michael B. $22 (2nd donation), Konstantin H.
$22 (2nd donation), Janne P.
$22 (2nd donation), Martin O. $22 (2nd donation), Dieter B. $22 (2nd donation), Timo M.
$20 (12th donation), Lance M.
$20 (7th donation), Donald M.
$20 (7th donation), Anne-christine U. $20 (6th donation), Carl K.
$20 (5th donation), CW P.
$20 (4th donation), Kostas M. K.
$20 (4th donation), Harald S.
$20 (3rd donation), L. W.
$20 (2nd donation), E M. G.
$20 (2nd donation), John K.
$20 (2nd donation), Gordon L.
$20 (2nd donation), David P.
$20 (2nd donation), James S.
$16 (22nd donation), Andreas S.
$16 (5th donation), Alain P.
$16 (4th donation), Juergen M. B. $15 (18th donation), Stefan M. H.
$15 (4th donation), Kiyokawa E.
$15 (2nd donation), Stephen M.
$12 (23rd donation), Johann J. $12 (22nd donation), Johann J. $12 (6th donation), Toni K.
$11 (14th donation), Doriano G. M.
$11 (5th donation), Wolfgang G.
$11 (3rd donation), Arjan V. B. $11 (3rd donation), Marius G.
$11 (3rd donation), Martin H.
$11 (3rd donation), Lars-erik J. $11 (3rd donation), Andrei Z. $11 (3rd donation), John O. $11 (2nd donation), Zdravko S.
$11 (2nd donation), Alfio R.
$11 (2nd donation), Niels B. $11 (2nd donation), Christina K.
$11 (2nd donation), Reg O. $11 (2nd donation), Victor S.
$11 (2nd donation), Alexander K.
$11, C.f. V. D. E.
$10 (36th donation), Thomas C.
$10 (27th donation), Frank K.
$10 (24th donation), Paul O. $10 (22nd donation), Jim A. $10 (19th donation), Dinu P.
$10 (14th donation), Rick R.
$10 (6th donation), Debora G.
$10 (6th donation), Gary L.
$10 (6th donation), John T.
$10 (5th donation), Jason D.
$10 (5th donation), Ishiyama T.
$10 (5th donation), Michael P. K.
$10 (4th donation), Richard L.
$10 (3rd donation), Tyler B. $10 (3rd donation), Jorge M.
$10 (3rd donation), Коновалов Е. $10 (2nd donation), Bob S.
$10 (2nd donation), Diane K.
$10 (2nd donation), Norman I. $10 (2nd donation), Arvind P.
$8 (15th donation), Aliki K.
$6 (2nd donation), Petar R.
$5 (15th donation), Dmitry P.
$5 (12th donation), J. S. .
$5 (12th donation), Olaf B. $5 (6th donation), Randy D.
$5 (5th donation), Antonio C. L. S.
$5 (4th donation), Udo M.
$5 (4th donation), Tomasz R.
$5 (4th donation), Dionisios K.
$5 (4th donation), Kim T.
$5 (3rd donation), Patrick H.
$5 (3rd donation), Pawel K.
$5 (2nd donation), Lois F.
$5 (2nd donation), Stefan S.
$5 (2nd donation), Christopher U. $5 (2nd donation), Matthew L.
$4 (2nd donation), Michele C.
$3 (4th donation), Omar Q. $3 (3rd donation), Gianluigi M.
$3 (3rd donation), Alden C. G.
$3 (3rd donation), Chameka L.
$3 (2nd donation), Chameka L.
$2 (6th donation), Stefan B. $2 (4th donation), Rowdy A. $2 (2nd donation), Timo P.
$2 (2nd donation), Hilmi H.
Linux Mint is proudly supported by 167 patrons, for a sum of $846 per month. 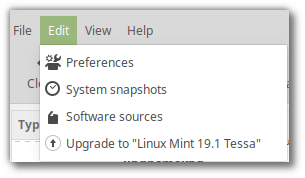 It is now possible to upgrade Linux Mint 19 to version 19.1. If you’ve been waiting for this we’d like to thank you for your patience. You can use Timeshift to make a system snapshot before the upgrade. If anything goes wrong, you can easily restore your operating system to its previous state. Launch Timeshift from the application menu, follow the instructions on the screen to configure it and create a system snapshot. 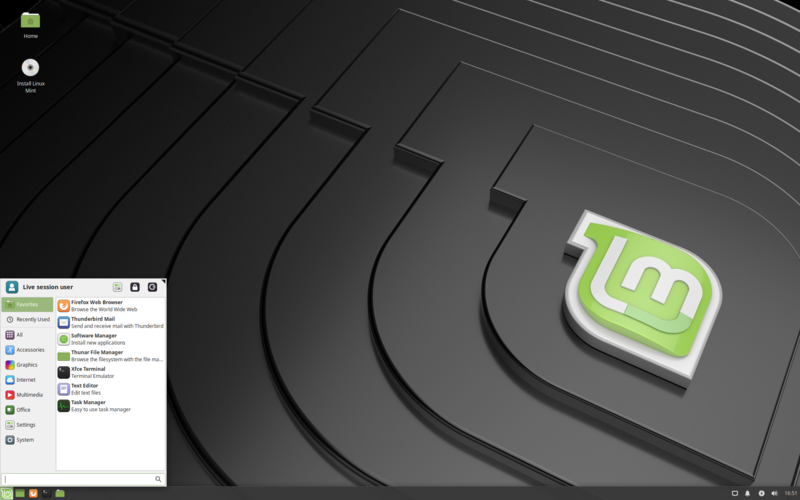 Upgrading to Linux Mint 19.1 is relatively easy. Launch the System Upgrade by clicking on “Edit->Upgrade to Linux Mint 19.1 Tessa”. If asked whether to keep or replace configuration files, choose to replace them. If the upgrade is not available to you, check that you have the latest versions of mintupdate and mint-upgrade-info installed and restart the Update Manager. If the latest versions are not yet available in your mirrors, switch to the default repositories. This happens rarely, but if you ever got locked and were unable to log back in, switch to console with CTRL+ALT+F1, log in, and type “killall cinnamon-screensaver” (or “killall mate-screensaver” in MATE). Use CTRL+ALT+F7 or CTRL+ALT+F8 to get back to your session. 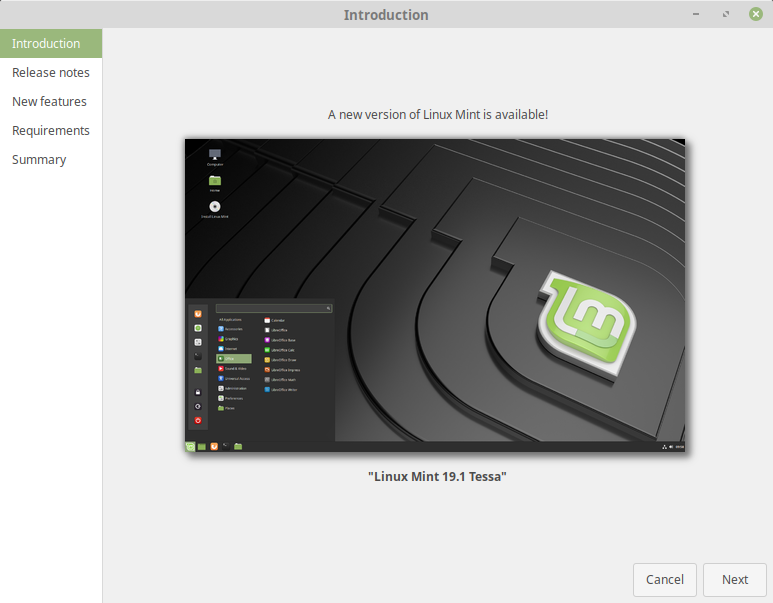 The team is proud to announce the release of Linux Mint 19.1 “Tessa” Xfce Edition. 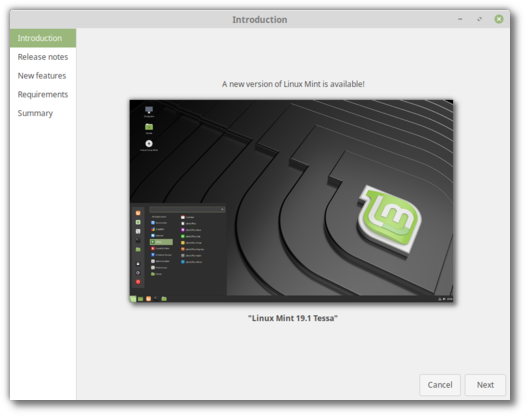 “What’s new in Linux Mint 19.1 Xfce“. 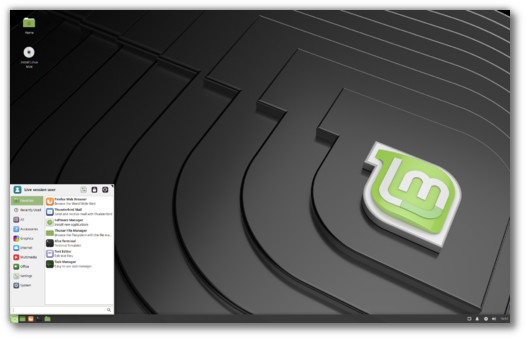 Announcements will be made shortly with instructions on how to upgrade from Linux Mint 19.